Well, it was worth waiting for. And it was. The teams had been battling with reckless abandon for the entire contest, and somehow, coming down the home stretch, they dug deeper within themselves and called for more. The fans from Northeastern and Boston University were in full-throated roar, as they too had been all game long. There’s a lot of good college hockey yet to be played at TD Garden this year – both the Hockey East championships and the Frozen Four – but I doubt they’ll come close to matching the atmosphere of Beanpot. Nobody asked me, but here are some deep thoughts to rival those of Jack Handey. Big Picture: I know that the result, a BU championship, is a familiar one. 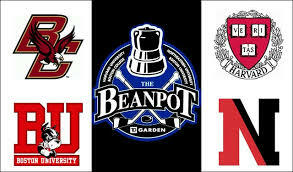 But the Beanpot is once again a four-team tournament. Three of the games this year went into overtime. In the one that didn’t, Northeastern scored with less than two minutes to play to defeat Boston College 3-2. All four Beanpot teams are contenders for advance to the NCAA Tournament. They won’t all make it; only BU is certain to receive a bid. But they’re all good enough. Northeastern’s Knocking: Yes, it’s 27 years and counting since the Huskies won a Beanpot. That was in 1988. It took them 29 years to win their first one, back in 1980. But during that initial span of 29 years, Northeastern made it past the first round to the championship game exactly three times. In olden times, they were the Beanpot doormat. Not any more. Since 1999, NU has played in the championship game eight times, including five of the last seven years. They will be back in the winner’s circle again soon. Husky fans, don’t lose faith. So will Harvard. The Crimson last won a Beanpot in 1993. That, also, is far too long a time. I thought that, going into this year’s tourney, Harvard was the best team. I’ve also told more than a few people that if Harvard gets another crack at BU in post-season, Harvard will win. Their go-ahead goal in the third period of this year’s first round, double-overtime loss to BU should not have been disallowed. Harvard’s first line of Alex Kerfoot, Kyle Criscuolo, and Jimmy Vesey is as good as any in college hockey – including Jack Eichel’s line at BU. Harvard has skill and speed, and they like to hit. They’ve also gotten good goaltending from Steve Michalek. After losing the consolation game, 3-2 in overtime to BC, Harvard will likely have to win the ECAC playoff championship in order to make the NCAAs. They can do it. Goalies: Michalek set a new Beanpot single-game record with 63 saves against BU. The old record of 52 was set by Jimmy Barton of BC in a 5-4 loss to BU in 1970. Michalek has the bigger number now, and hats off to him. But as far as I’m concerned, Barton’s performance, over 60 rather than 82+ minutes, is still the best ever. BU outshot Harvard this year but did not outplay them by much at all. Harvard probably should have won in regulation but had that goal disallowed. But back in 1970, BU’s barrage against Barton and the Eagles was constant, overwhelming, and unrelenting. The MVP: Matt Grzelcyk is Boston hockey’s feel-good story of the year. He’s the Townie kid whose father works on the Garden bull gang. He’s the kid who always dreamed of Beanpot heroics. His dream came true with two goals, including the overtime winner. Everyone has been talking about the year Eichel has been having, and rightfully so. He’s several cuts above everyone else, even as a freshman. The only other freshman of comparable skill I’ve ever seen was Brian Leetch of Boston College back in 1987. Eichel does it all, and the pros are drooling, but I hope he sticks around for at least another year. Eichel and linemates notwithstanding, Boston University would not be where it is without Grzelcyk. Matt is a defenseman, a member of the junior class. His team mates elected him captain to lead the turnaround after last year’s miserable performance. He had only played half the games last year before going down with a serious shoulder injury. But they elected him anyway. I frequently hear sports fans and sports writers wax poetic about this coach or that coach. “He’ll get them up for the big game,” of “He won’t let them lose again,” and so on. That’s overstating things by quite a bit. Success is all up to the players on the team, and especially to the upperclassmen who’ve been around for a while. The coach picks the players, sets the agenda, devises the strategy, teaches the game – but the players must take responsibility for their fate. That’s what’s happened at BU. When the players came back to campus in the summer, they wore t-shirts with “Never Again” printed on the back. Grzelcyk, along with the team’s only seniors, Evan Rodrigues and Cason Hohmann, have been leading the way. I suggest that they’re the ones who are primarily responsible for BU’s fast return to the Beanpot championship. Boston College, whose run of consecutive Beanpot crowns ended this year at five, has enjoyed a huge run of success since they made it to the NCAA Final at the Garden in 1998. Coach Jerry York is another who picks his players carefully, makes sure they buy in fully to his way of doing things, and then puts the onus on them to perform. For the past decade and a half, BC has had at least one high-scoring line, usually two, and sometimes even three. Not so this year. The Eagles have found goals very hard to come by. Every game is a nail-biter. But they’re still in second place in Hockey East with one weekend of play remaining. This may have been the best-coached team of Jerry’s tenure. It also follows that it’s a well-captained team. Like BU, BC has a junior defenseman, Michael Matheson, as captain. There are also two senior forwards, Quinn Smith and Michael Sit, who are alternate captains. BC has built a solid winning record on a good defense corps, strong goaltending, and four lines of grinders and muckers. Next Year: The first-round Beanpot pairings will be the same was this year’s championship round. Harvard and Boston College will play in the early game, and Northeastern will face BU in the nightcap. Maybe in 2016 we’ll finally, at long last, see a Beanpot final of Harvard vs. Northeastern. For me, that’s a bucket-list item. Where have you gone, Wayne Turner? Husky Nation turns its lonely eyes to you. In Boston, it’s starting to feel like 1978 with all this snow on the ground and predictions of more. On Causeway Street, though, I hope we time-travel back to 1980. We need this generation’s Wayne Turner to come through with the game-winning goal and to bring the Beanpot back to Northeastern. After that, we need 2016-2018 to reprise 1981-1983. In those three years, BU, BC, and Harvard all won a Beanpot championship. We need this February festival to be a true, four-team event in which every squad has a strong chance to emerge the winner. The years from 1980 to 1983 were the only four-season span in which every team took the title once. I think that such balance is coming back. Let’s hope that it does. It’s hard to believe that the Huntington Hounds haven’t been Beanpot champions since 1988. They have come up empty in their last 26 tries. 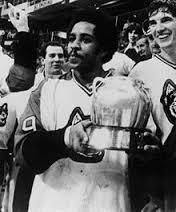 When Turner scored that magical overtime goal to beat BC 5-4 back in 1980, it gave Northeastern its first Beanpot crown ever. That took 29 years to accomplish. We had waited too long back then, and we’ve waited too long now. It’s just as bad over at Harvard, if not worse. The Crimson have not been Beanpot champs since 1993. Moreover, Harvard has made it to the final round just once since the year 2000. On Monday night, Northeastern will be making its seventh appearance of the current millennium in the Beanpot title game. This is the fifth time in the last seven years NU has gotten that far. By contrast, before NU won the 1980 championship on its 29th try, it had made it to the final round exactly twice. There has never been a championship final game pitting the Huskies against Harvard. We almost got to see one this season. Boston University spoiled that possibility when they beat the Crimson 4-3 in double overtime in round one. Harvard’s Steve Michalek’s incredible 63-save goaltending show went for naught. Northeastern got a goal from defenseman Dustin Darou and beat Boston College 3-2 in the second game of this year’s first round. It came with less than two minutes to play and just before midnight. Maybe Darou is the Huskies’ Malcolm Butler. Dustin had scored only one other goal in his college career up until that point. That set up this year’s final, with the 11-11-4 Huskies taking on the 17-4-4 Terriers. NU’s win over BC was not a giant upset. The Eagles were favored, but only slightly. Northeastern’s record is deceiving. They started off 0-8-1, so since mid-November their record is 11-3-3. And it’s been against some pretty tough foes. It’s unfortunate that the postponement for snow, followed by those horrendous snarls on the roadways and on public transit systems, kept the first-night crowd at the Garden well under capacity. The whole evening was college athletics at its best. Every year we say that the teams are evenly matched and that any one of them could win. But it was true this year. Both Harvard and Boston College played terrific games, even in defeat. The Garden fans, all of them knowing that their respective teams had a real chance to win, were loud and spirited. Even the national anthem singers, Taylor Carol of Harvard and Grace Greene of Boston College, delivered boffo performances. Grace’s sons Matt and Justin played hockey for BC a few years ago. Her “Land of the Free” flew higher than the Garden rafters, much to the delight of the cheering fans. If you were there, I’m sure you agree that it was a wonderful night of sport. If you weren’t, you missed something special. Next year the first-round pairings are the same as this year’s second night: BC-Harvard in the opener and BU-Northeastern in the nightcap. So maybe in 2016 we’ll see that long-awaited championship matchup between the Huskies and the Crimson. Harvard needs a Beanpot win. They’re vastly improved, and they’ll have most of their stars back again next year. So there’s reason to be optimistic. But Northeastern has been knocking on the Beanpot door incessantly. They’ve won it only four times. They’re way overdue. It’s time for them to win again. You are currently browsing the Veteranscribe's Blog blog archives for February, 2015.